To achieve a maximum yield it is essential to maintain a plant's shape and remove any unnecessary or damaged growth. This is most important when growing indoors under artificial lights. Pruning: Once the initial 3 or 4 true leaves have formed, a plant can be made to possess 2 or more main stems by removing the 'terminal growing tip' (Fig 13.1a). The new main stems will grow from the 'axillary buds' located at the remaining leaf nodes (Fig 13.1a & 13.1b). Apart from being shorter than a single stemmed plant of the same age, multiple stems allow a classic "goblet" shaped structure to form (Fig 13.3a). This shape generally permits better airflow and light penetration throughout the foliage. Photosynthesis takes place mainly in young-maturing leaves. Older leaves and those partly shaded photosynthesize less, thus drawing on the nutrition from young-maturing leaves for their survival. For this reason, it is worthwhile removing the lower, older foliage. This practice is most relevant when growing under artificial lighting because the lower growth is furthest from the light and therefore has least potential to photosynthesize and be of benefit to the remainder of the plant. For many species, major 'structural' pruning should only be conducted during the vegetative phase. Unless there is over-crowding or damaged growth (see below), avoid stressing plants by pruning during flowering. Plant stress can be minimized by conducting major pruning in stages. For example, allow plants to rest for a week or so between prunes. ● Trained to grow horizontally (Fig 13.3b). Many plant species will respond to this treatment by producing floral growth at the point where the stem is bent beneath the net. ● Allowed to grow through the netting (Fig 13.3a). However, if they grow too tall they can be bent down under the netting again. NOTE: Pruning/ training/ shaping requirements will vary from one plant species to another. For specific advice ask your local grow shop or nursery. Removing dense growth will allow better airflow and light penetration throughout the foliage. This will enable fruit to ripen more quickly. Broken, dying or dead growth is susceptible to disease and pest attack and therefore should be promptly removed from the plant and the growing area. Where to cut: When pruning ensure that the cut is both neat (i.e. no bark stripped away from the cut face) and close to the stem (Fig 13.4a). Doing this will help ensure that the cut heals quickly and completely thereby minimizing the risk of disease and pest attack (Fig 13.4b). Pruning tools: Suitable tools for pruning include secateurs or a sharp blade (e.g. scalpel). For a neat and clean cut, tools should be sharp and sterilized with bleach prior to use. NOTE: Pruning/ training/ shaping requirements will vary from one species to another. For specific advice ask your local grow shop or nursery. Also, do not over-prune and risk depriving the plant of leaves that might be required for a necessary growth spurt. 1. Netting: Wide mesh netting stretched across the growing area acts as a support once the plant grows through it (Fig 13.5a). However, this method will inhibit physical access to the plants where it is done over a large area. 2. String: String that is hung from a ceiling support and tied to the stem is especially effective for tall plants. 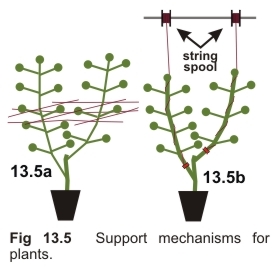 The string is simply wound around the stem as the plant grows in height (Fig 13.5b). Use a coarse grade of string to minimize the threat of it cutting into the stem. 3. Stakes: Rigid stakes can be used where plants are grown in pots. To avoid damaging the roots, position the stakes prior to planting.